KickServe: Is Gael Monfils a chance? 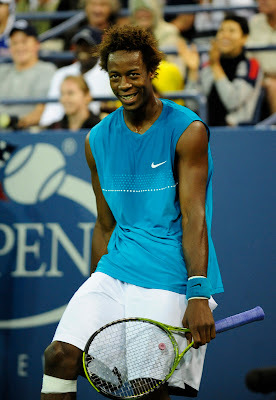 Is Gael Monfils a chance? Thanks to Oudin’s heroics and the dismalness of Safina, Ivanovic and Jankovic - one of these players will make the final: Kvitova, Wickmayer, Dulko, Oudin, Bondarenko the Lesser, Petrova, Wozniacki or Kuznetsova. Methinks the next round between the Woz and the Kuz has a lot riding on it - a spot in the final no less. Meanwhile Pennetta the awesome continues to grind through the draw, can she take down Serena too? Otherwise Clijsters will have to do double Williams duty after dispatching the gutsy Li Na. Fed should beat Robredo, who knows if Davydenko cares enough to win against Soderling, the Djoker gets the Worm and five set veterans Isner and Verdasco face off in another marathon. Sorry USA.